First WBC and now MLB. Baseball will test an extra inning tie breaker mitigation strategy by forcing teams into a situation that should logically lead to more runs being scored during the sport's overtime period: start all extra frames with a runner on second and none out. As hockey attempted to increase the potential for sudden-death scoring by changing its overtime period from a four-on-four to three-on-three format two years ago, baseball too is considering a tilt in the favor of extra inning offense by starting play with a free runner on second base. Chief Baseball Officer Joe Torre told Yahoo! of several reasons for such a move: to shorten the length of games, relieve pitcher fatigue, and even compensate for modern players' 'me first' attitude: "What really initiated it is sitting in the dugout in the 15th inning and realizing everybody is going to the plate trying to hit a home run and everyone is trying to end the game themselves." 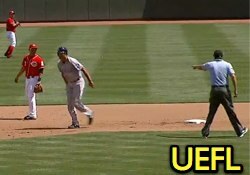 Bryce Harper is ejected during an extra inning. Professional baseball will apparently test its newest game-shortening effort in the minors and rookie-level Arizona and Gulf Coast Leagues, which begin their shortened seasons in the summer. The proposal has not yet been sent to the Major League players' union, which means it is not yet ready for consideration or adoption at the sport's highest level. The 2017 World Baseball Classic already added the extra inning tiebreaker strategy to its rule changes, though WBC's modification will place baserunners at both first and second base, and will begin in the 11th, as opposed to 10th, inning of play. Unlike the international rule, 2017's MLB/MiLB test will only add a runner to second base (not first), and may begin in the 10th, as opposed to 11th, inning. Strategy-wise, this would eliminate the potential for a force play at third base, unless the defensive team elects to walk the batter to set up the first-and-second situation...possibly by making use of the new intentional walk shortcut, pending players' union approval.